The ruins of Spiš Castle (Slovak: Spišský hrad, pronunciation (help·info); Hungarian: Szepesi vár; German: Zipser Burg) in eastern Slovakia form one of the largest castle sites in Central Europe. The castle is situated above the town of Spišské Podhradie and the village of Žehra, in the region known as Spiš (Hungarian: Szepes, German: Zips, Polish: Spisz, Latin: Scepusium). It was included in the UNESCO list of World Heritage Sites in 1993 (together with the adjacent locations of Spišská Kapitula, Spišské Podhradie and Žehra). This is one of the biggest European castles by area (41 426 m²). 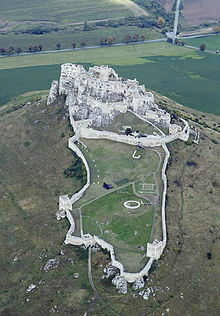 Spiš castle - the central part. In 1780, the castle was destroyed in a fire. The cause of the blaze is unknown, but there are a few theories. One is that the Csáky family purposely burned it down to reduce taxes as at the time additional taxes applied to roofed buildings. Another is that it was struck by lightning, which started the fire. A third is that some soldiers in the castle were making moonshine and in the process accidentally started the fire. Whatever the case, after the fire, the castle was no longer occupied and began to fall into disrepair. The castle was partly reconstructed in the second half of the 20th century, and extensive archaeological research was carried out on the site. The reconstructed sections house displays of the Spiš Museum, and artifacts such as torture devices formerly used in the castle. Wikimedia Commons has media related to Spišský hrad.